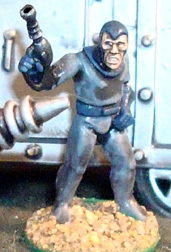 There are three packs, PWM16-18, each of 5 figures (with one figure being an emplaced ray gun). As always, they are cleanly cast, with no flash, and minimal mould lines. 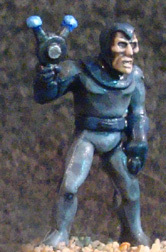 The figures themselves represent the rubber-suited minions of an evil mastermind in the spirit of the old movie serials. They portray these well, evoking the genre perfectly: So much so that I had to build a juggernaut to accompany them. 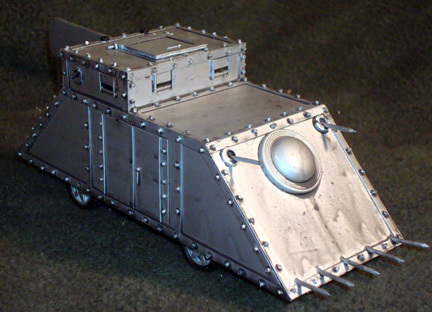 The Juggernaut is loosely based on the vehicle in the ‘Undersea Empire’ serial of the 1930’s. The body is made from styrene sheet of various thicknesses, and the rivets are punched using a 1mm hole punch. 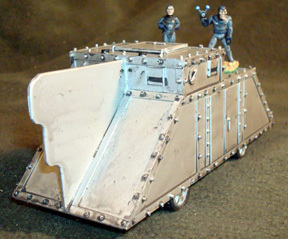 I bought a plastic model tank at a dollar store, intending to use it’s single-piece tracks , but they proved unsuitable. Thankfully it also had wheels so it could roll, and these were perfect. The windows/shutters were made from plastic & stretched sprue, and were built on a soft plastic sheet. 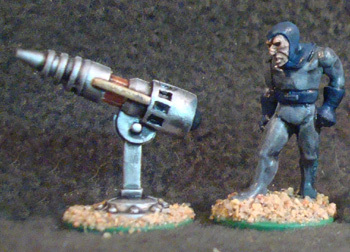 When they were hard, I popped them off the sheet and attached them to the turret. The roof hatch opens so the commander can look impressive as it screams along the road. The front boss is a button, and the spikes are small nails. 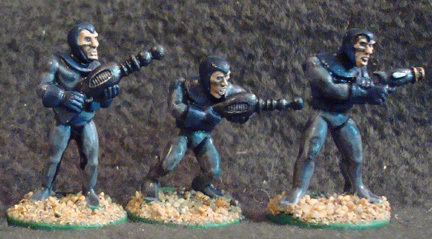 I am pleased with the juggernaut, and I am VERY pleased with my Pulp Figures Zombies of the Ionosphere. 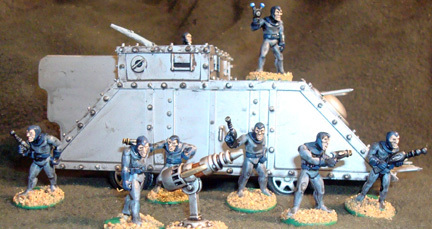 These are brilliant, pulp is a genre close to my own heart and you’ve really done these proud, that tank is a work of art! many thanks for following me. I will happily reciprocate. Thanks for the kind words, they are greatly appreciated.